Opened in February, 2004, Nassau Downs OTB’s RACE PALACE quickly established itself as the best off track racing facility in New York State and one of the premier teletheaters in the country. The amenities and wagering equipment provide a state of art racing experience with the highest level of customer service. 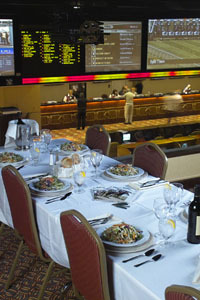 There are many options available to our customers, the latest wagering platforms and information provided on Scientific Games Bet Jet SL Self Service Terminals, Interactive Personal Terminals, Color Tiny Tims, individual Player Carrels and new Bet Jet Cashier terminals featuring Clear Bet technology and a 120 foot video wall featuring simulcasts of the best racing from US and International tracks, and three special VIP rooms. Patrons can experience a variety of dining options with great bar and food service. There’s something for everyone at the “one of a kind” RACE PALACE. Whether you’re a beginner or an experienced Player, The RACE PALACE is the “ShowPlace for Winners”. When it’s time to plan an unforgettable party, fund raiser or corporate function Nassau OTB’s Race Palace is your best bet. Pulse-pounding excitement of the Sport of Kings in an opulent setting. Long Island’s only 120-foot video wall & hundreds of LCD flat screens simulcasting live thoroughbred and harness racing from race tracks across the USA & the world. Broadcasts of top sporting events. Download theNight at the Races Party Planning Brochure The brochure is in Portable Document Format (PDF) and requires Adobe Acrobat Reader. Click here to download the reader. Please familiarize yourself with the following rules and policies before visiting the Race Palace. Minimum betting age is 21 years old. Minors must be accompanied and supervised by an adult. No offensive or disturbing behavior permitted. No loitering, soliciting, stooping, touting or bookmaking. Track prices are paid for all winning wagers placed at the Race Palace. Customer is responsible to check tickets. OTB assumes no responsibility for errors after the customer leaves the window. OTB assumes no responsibility or liability for errors or omissions in programs or profiles. Cancellations of large wagers are subject to management approval as per NYSRWB. Copyright 2010 Nassau Downs OTB. All rights reserved.